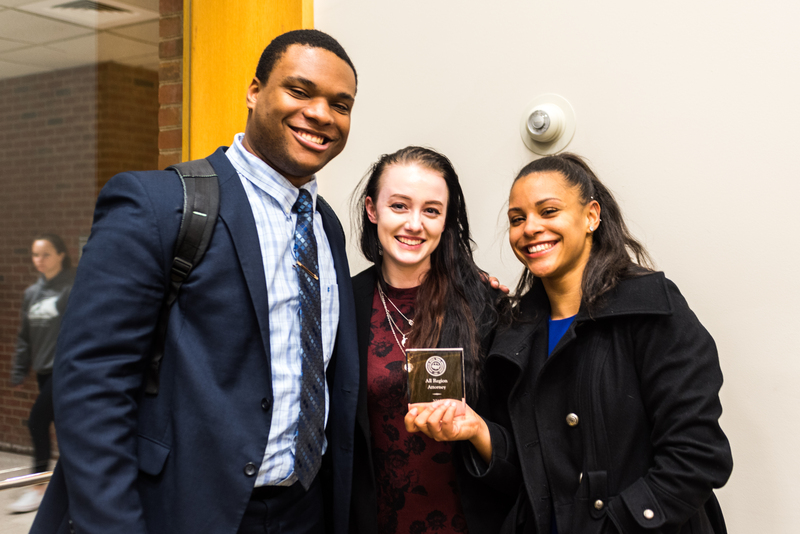 UMBC Mock Trial is moving on to ORCS, as both the A and B teams had strong performances at Regionals and earned bids to the 2018 Lancaster, PA Opening Round Championship Series! This comes on the heels of a strong fall season and stellar performance at the final invitational tournaments of the 17-18 season. After an outstanding fall campaign, capped off by the A team earning 4th place in the “A” division at Yale University, the teams spent winter break honing their theories and performances. On January 20 & 21, 2018, both teams headed back down I-95 to Georgetown University, for their annual Hilltop Invitational. Both teams shook off the rust and had great trials, and senior B team witness Krishna Gohel won an Outstanding Witness award in her first tournament of the season. The next weekend, both teams traveled north to Cornell University for BRIC: the Big Red Invitational Classic. UMBC B had a fantastic weekend, earning Honorable Mention honors with a 5-3 record. UMBC B attorney Sydney Gaskins earned her second Outstanding Attorney award, and UMBC B witness Evan Kellner won his first-ever Outstanding Witness award. After the invitational season ended, the teams didn’t sit back and relax. Both teams traveled to American University and Stevenson University for scrimmages, and hosted Towson University for a scrimmage. Finally, UMBC A and UMBC B faced off in the fourth annual “Black v. Gold” scrimmage, where many friends and family members came to campus on the last Sunday before Regionals to watch our two outstanding teams face off in their final tune-up before official AMTA competition season. The following weekend was a great one for UMBC Mock Trial. At the Stevenson, MD Regional, co-hosted by UMBC and Stevenson University, both UMBC A and UMBC B earned bids to ORCS! UMBC A went 7-1, with ballot sweeps of New York University, Iona College, and Brooklyn College. UMBC B went 5-2-1, with ballot sweeps of Stevenson University and the City College of New York, as well as a pivotal win and tie against George Washington University A in round 4 to earn a second ORCS bid for the program. This was the second year in a row that UMBC Mock Trial advanced both the A and B teams to ORCS. In addition to team awards, team members came home with several pieces of individual hardware. Senior Vice-President and A Team attorney Summer Akhtar earned an All-Region Attorney award, as did freshman B Team attorney Sydney Gaskins – her third attorney award of the season. Senior A Team witness Lily Felber earned an All-Region Witness Award, her second All-Region award, and Junior A Team attorney/witness Sam Dhawan earned an All-Region Witness award – his first witness award. As the teams move forward to ORCS, it’s worth taking a look back at the remarkable season for the program so far. UMBC Mock Trial teams have earned seven team awards and ten individual awards, and traveled to seven of the most prestigious invitational tournaments in the nation. In just seven years, the program has grown into a nationally-recognized powerhouse, with much more still on the horizon. Both teams are now hard at work preparing to compete at the Lancaster, PA ORCS from March 23-25, 2018. UMBC A will look to return to the National Championship Tournament after their first-ever bid in 2017, and UMBC B will attempt to join them at the NCT for the first time.